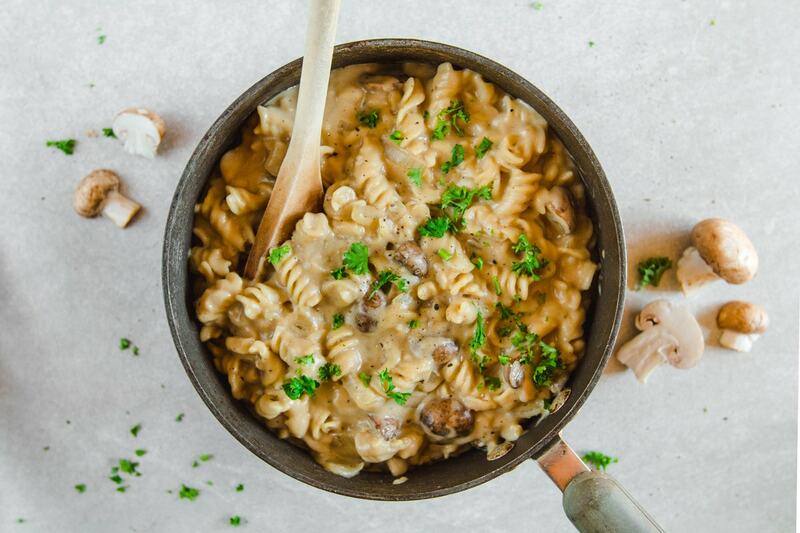 My One Pot Vegan Mushroom Stroganoff is a healthy & hearty twist on a classic Stroganoff! This cozy and creamy noodle dish is sure to be a crowd-pleaser. While I currently live in the always-hot city of Miami, I grew up on the East Coast and am very familiar with cold and chilly winters. This is one of those meals that is perfect for those days when you’d like to just stay bundled up under the covers…but resort to a sweater and fluffy socks instead. Not only is this meal hearty, filling, and satisfying, but it’s also healthy, gluten-free, AND you only need one pot to make it! No, not the “cook your pasta first, rinse out the pan, make your sauce, then mix everything together” kind of recipe. You *literally* just dump everything into one pot — pasta and all — let it simmer for a few minutes, and then it’s ready to serve. An added bonus to cooking everything in one pot? So. Much. FLAVOR! 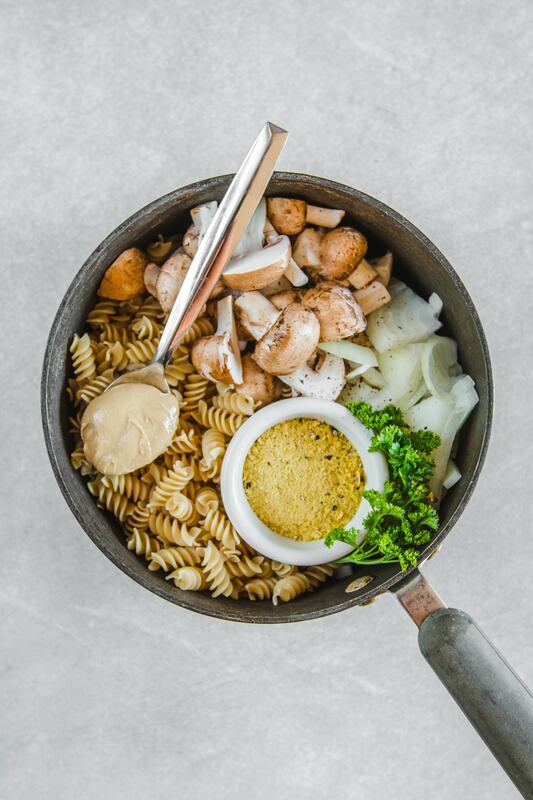 Cooking the pasta in our delicious Stroganoff sauce definitely takes this to a whole other level. I’m definitely going to be cooking my pasta like this more often! I’ve already made this recipe for three different groups of people and it was a major hit. You only need 9 simple and healthy ingredients plus 20 minutes to make this recipe, and I promise it will leave even the most plant-fearing person feeling happy, full, and satisfied. 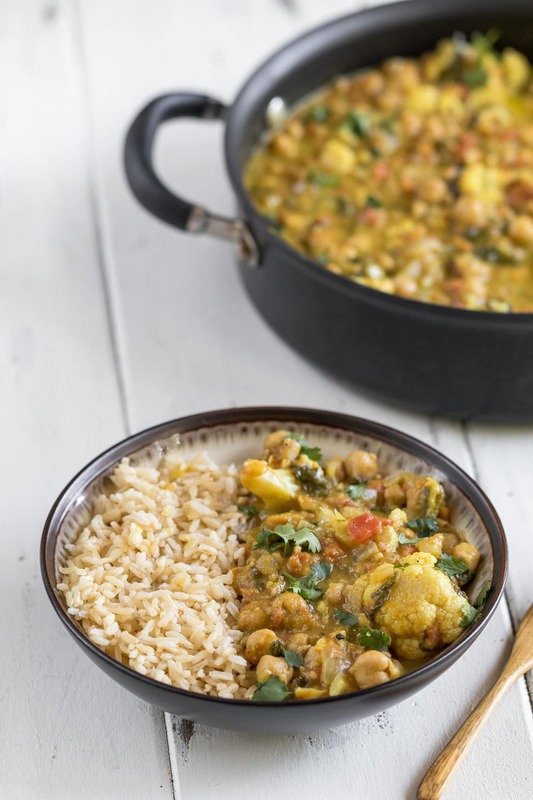 This one pot recipe is also a collaboration with my friends Jasmine and Chris of Sweet Simple Vegan, who made a tasty Cauliflower & Chickpea Curry! I used Gluten Free Rotini noodles for this recipe, but feel free to use any noodle of your choice. This meal is very hearty and comforting and can easily serve a large group of people. If you want to add a little volume to your meal, I think this would be excellent with some sautéed greens. Looking for more comfort-style healthy meals? You’ll also love my Baked Vegan Mac & Cheese or my Pesto Pasta Bake! Peel your Onion, cut it in half, and then thinly slice it into half “rings.” Clean your Mushrooms using a damp paper towel or cloth, then cut in half or fourths, depending on size. You want to keep the Mushrooms relatively large, as they will shrink when cooking and are meant to imitate beef in this recipe. Pour a splash of water to a large pot over medium heat. Add in the sliced Onions and cook until translucent, about 3-5 minutes. Add in the Pasta, Mushrooms, Beef-flavored Broth, Nutritional Yeast, and Black Pepper. Bring to a boil and let simmer for 10-15 minutes, stirring occasionally to ensure nothing sticks to the bottom of the pan. Turn the heat off, then stir in the Cashew Butter and Lemon Juice until everything is well incorporated. Taste the pasta and add any additional Salt, if necessary. I opted to use Cashew Butter instead of cashews in this recipe for convenience. This brand is my favorite, but if you prefer to make your own, here’s an easy recipe. I used this brand of Vegan Beef-Flavored Broth and thought it had a great flavor! If you can’t find Beef-flavored broth you can substitute Veggie Broth, but this recipe will not taste as realistic. I made this today with the nut-free sour cream instead of the cashew butter (my kids are allergic as well). It turned out great and it is already gone…lol. For sure, a hit! Yay! I’m glad that worked for you, Amber! Thanks for leaving that comment Amber! I made this last night and loved it, but was looking for something besides cashew butter in order to make it slightly less caloric. What brand of vegan sour cream did you use? I’ve never tried vegan sour cream. Thanks! Hi! I use Tofutti brand vegan sour cream. It doesn’t take a lot and it worked great in this recipe! Thank you for sharing this recipe. So happy you asked bout a nut-substitute Kali, I can’t wait to try this ! Hi, I’m not nut-free but a friend is so asking for possible future dinner parties– would vegan mayo work too? Or is there something about cashew butter and vegan sour cream that is important for the flavor? I think Vegan Mayo would be fine, though I have not tried it myself! I used vegan mayo, DELICIOUS!!!!!! No, Cashews are pretty mild! Hi Caitlin! This looks amazing- could I use tahini in place of cashew butter? You can, but it will taste like Tahini! I use tahini in place of the cashew butter. It’s delicious! Can’t wait to try this. I think I’ll substitute the plain nutritional yeast with Pop Zest’s Olive Oil & Herb Nutritional Yeast! Thanks for posting the recipe! Good grief, was this ever delicious. It was exactly as advertised. Ridiculously fast, so simple, and amazingly delicious. This one will go into regular rotation. Thanks! This was sooo good! Mine turned out soupier but I think it was because I made it with konjac rice instead of pasta. It was all I had :p so tasty though! I was going to ask if this recipe would work with rice. Going to try that as I’m on a rice kick! Glad to hear it, Azalia! Sooo delicious Caitlin!! And incredibly easy! You really nailed it! Amazing! My non-vegan husband LOVED this recipe and called it one of his all time favs! Truly appreciate all your amazing recipes and vegan tips! This looks delicious, is there anything that could replace the nutritional yeast or could I leave it out? I’m trying to like it but I just don’t care for the flavor. This sounds really good! What brand of ‘beef’ flavored veggie broth do you use? Hi what brand is the cashew butter you use? I linked it in the Recipe Notes! I prefer Artisana Organics, but I have also used Trader Joes and Thrive Market brand in the past. YES! Glad to hear it was a success, Hailey! ^^^^^^ this comment is hilarious!! What type of immatation beef broth did you use ? Omg!!!! Caitlin!!! This was delicious! I took my first taste and it made me say, wow, this is good. This was my first vegan fish I have every made. Thanks so much for sharing. I will definitely try more. I will try the cauliflower and chickpea curry from Jasmine and Chris next? Could you use almond butter in place of the cashew butter? Trying to make safe for a cashew and dairy allergy. Hi Amy, if you substitute Almond Butter there will definitely be an almond taste to this recipe. I would recommend using a Vegan Cream Cheese or Sour Cream instead! If the cashew butter I have isn’t raw, it has roasted cashews, is that okay? Or will it make it taste super weird? Exactly what I needed. Way to go Caitlin, you’re awesome. Oh man, made this for dinner tonight and it was SO GOOD!!! Definitely going into our regular rotation! Added some frozen peas, beans and broccoli for some greens. SOOOOOOO good; thank you! I made this this morning, in my instant pot – WIN WIN WIN! I used whole grain pasta, put all the ingredients (except nut butter and lemon) in the instant pot, cooked at low pressure for 1/2 the time listed for stove top cooking the pasta. I quick released the pressure, then stirred in the lemon juice, and tahini (I didn’t have cashew butter on hand). I used vegetarian Better than Bouillon as the pseudo-meat flavors don’t appeal to me (>30 yr vegan). SOOOOOOOOO GOOD!!!!!! This is definitely on my menu rotation, and I’m 98% certain that meat-eater boyfriend will devour this without question. Thanks for the great recipe! You are so welcome, Jan! Thank you so much for posting what you did with the instant Jan!! I just made this for dinner and it was delicious!! I couldn’t find the beef flavored ‘better than bouillon’ so I used the normal veggie one and it still turned out so good. Will definitely make again! Do you think adding in some spinach toward the end would end up well? Great! Also, when it says “bring to a boil and let it simmer” does that mean bring it to a boil, then turn it down to a simmer? Or bring it to a boil and let it sit at a boil for 10 minutes? Thanks! It means put the heat on high, and then once it begins to boil, reduce the heat to low and let it “boil” (really a simmer) over a low heat for 10 minutes. Hii Caitlin! I’m wondering about the imitation beef you used. I found the same one that you linked, but noticed how much sodium is in one teaspoon- the recipe says four cups. Do you dilute it with water? Hi Maggie, one teaspoon makes one cup of broth! So I used a heaping tablespoon for this recipe. If you’d like to reduce the sodium content, you can reduce the amount of broth and use water instead. It will not be as creamy, but it should still be tasty! My non-vegan bf made this for me without the cashew butter and with veg. broth. It still came out amazing! This IS DELICIOUS!!!! …. Makes it easy to be plant-based when food tastes this good. I used veg broth with an extra teaspoon of Better Than Vegetable Bouillon and it was super yummy. Hi, I’m wondering if there’s strong taste if I used tahini instead of cashew butter? Caitlin-You seriously are killin’ it! Every single recipe I ever test rocks my world. I appreciate this so much, because we all know what it feels like to be excited about a new recipe, and then it is an epic fail. Thanks for all you do to make eating plant based so fulfilling ! Delish! Thank you so much, Krystal! I made mine using veggie broth and tahini instead of cashew butter . I also added 2 drops of liquid smoke to add that « beefy » flavor. It was delicious! OMG! Soooo yummy! I used onion bouillon instead of imitation beef. And even my household carnivores LOVED it! So delicious ? Pinning for later! This looks so good!! Great recipe! I added spinach, a tablespoon of soy sauce, 1 tsp thyme, and 2 tablespoons of flour to thicken up the sauce. I also subbed vegan cream cheese for the cashew butter and it tasted great! I blended it with lemon juice before adding to mushrooms. Yaaaaaaas! It was so good and hearty! Could you estimate weight mesurements for the pasta and cashew butter? I just wanted to thank you for this recipe! It’s one of the most delicious, and easiest meals I’ve ever made. You need a restaurant ASAP lol. Definitely sharing this with everyone. If you make this recipe and use the Better than Boullion- Beef that she recommends this will not be a vegan recipe. Here are the ingredients: ROASTED BEEF WITH CONCENTRATED BEEF STOCK, SALT, HYDROLYZED SOY PROTEIN, SUGAR, CORN SYRUP SOLIDS, FLAVORING, YEAST EXTRACT, DRIED WHEY (MILK), POTATO FLOUR, CARAMEL COLOR, CORN OIL, XANTHAN GUM. I’m going to make this tomorrow and plan on using veggie broth-I’ll post my thoughts using veggie broth. Love this recipe! This is the 2nd time I’ve made it and it turned out great every again. Thanks for sharing this terrifi one-pot recipe — this gives me a jump on this week’s meal prep. Cheers! Hi, Caitlin!! This recipe was soo delicious. I couldn’t find the vegan beef boullion you used so I substituted it with the no chik’n boullion cubes. It was equally amazing. The spiciness gave it an extra kick too. Thanks for sharing this incredible recipe! I’d start with 3 tbsp or so, and add more in 2 tbsp increments if the pan dries up! I made this for the first time last night, and it was absolutely delicious! I used vegan cream cheese instead of cashew butter and it worked really well. Thanks for sharing this recipe! Can I substitute something for. Cashew butter? Yeah this was amazing for so many reasons. Tasty, creamy, warming, ethical towards the animals, and fast. Tank you for sharing this recipe. How could i adds gardein beef strips to it? Awesome mushroom tip, I’m pretty new to cooking so it was helpful! I almost took a glamour shot of the creaminess just to show you how mine turned out because it looked so much like yours hahaha I was proud, you’re a great at writing simple delicious vegan recipes for everyone thank you! mine is really soupy what do i do? You can strain the liquid out, or let it cook a little longer. Hi. What can I substitute for yeast in this recipe? Hi Priya, the Nutritional Yeast is different from Baker’s Yeast – it does not “do” anything to the recipe, but rather adds a cheesy flavor. If you can’t find any, you can simply leave it out! Made this tonight – OMG so so yummy! Wow. delicious! I decided to opt for the cream cheeze and I added peas & shredded spinach. Thanks for such a lovely easy dish! I’ve made this recipe a few times now and it never disappoints. It so perfect for comfort food cravings. Love it! Thank you for this lovely recipe. Couldn’t find the broth in my local HFS so I just used some veggie broth I had at home and threw in some spinach and a little extra spice. It was great. I will keep my eyes open for the one you pictured above. Maybe WF will have it. Love that this is so easy and is made with stuff I generally have on hand :). Wow!!! Perfect, so simple and sooo delicious! Thanks SO much for this recipe! Wow! What a great recipe. My family LOVED it! Because my fresh mushrooms were a little slimy and beyond their peak, I used frozen shiitake mushrooms and they worked fine. I also added the stems of broccolini and in the last 5 minutes I added frozen peas. This pasta was absolute comfort food. I will definitely move this into my family dinner rotation. oh peas! good call, I am going to add some! Hi Sara, if you don’t have lemon juice, you can just leave it out. I would suggest maybe adding 1 tsp or so of apple cider vinegar to help make things more tart! This looks amazing. How could I use zucchini noodles instead? Wow this was easy, fast, and delicious! I used mushroom broth and tofu cream cheese instead as that’s what I had. Creamy and super satisfying. Even my son who doesn’t like mushrooms devoured it as I cut up the mushroom into very small pieces. Lemon juice adds just the right amount of tang. OMG! I just made this today and it is DELICIOUS! And easy to make, too. I’m officially obsessed. Thank you! I had to see what the hype was all about so I made this tonight. I used non vegan beef broth instead (cause I’m not 100% vegan currently and I’m in a budget). I also added red pepper flakes and chives. IT IS SO GOOD!! You must make this. So creamy. Can’t believe it’s dairy free. I was looking for something quick, warm and savory. I Googled “Homemade vegan beef broth” and used the first recipe that came up. This recipe was creamy, dreamy, tasty and made my taste buds rejoice! I did not have any cashew butter but I took a cup of the homemade beef broth and a handful of cashews. Great recipe. Thank you for sharing! Oh my! I lost my nutritional yeast and only had regular veggie broth and this recipe was still DELICIOUS! So easy! Thank you! This is DELISH ! My husband and 8 yr old son both love it! We have made it a number of times using Pacific mushroom broth and it has turned out perfectly ! Just made this tonight…can’t believe how good this was! My omni husband LOVED it! I have another question! Have you tried making this with actual rice instead of rice pasta, and how much rice would you use? Stroganoff was me and my mom’s special treat that we would have together because no one else in our family liked it (crazy people), but she used to always serve it with rice even though that’s not the norm. We both stopped eating meat, and I wanted to share this recipe with her because it’s sooo good, but I know she’s going to ask about making it with rice! Hi Kara, unfortunately I have not tested this recipe with rice, so I cannot give an accurate answer! Great recipe! I don’t even like the real strogonoff, but I love this one. I tried this twice with substituting the cashew butter for peanut butter the first time, and then almond butter. The peanut butter was good but a little too present for my taster, but the almond butter worked great. I made this for dinner and it was delicious! I sautéed garlic, red, green, and yellow pepper to add color and when it was almost done, some fresh spinach. I also used chickpea rotini noodles to reduce the total carbs-everything blended wonderfully! My husband enjoyed it so much that he took some for lunch and he is not vegan. I used vegan cream cheese (instead of cashew butter) and a little less nutritional yeast because I can’t stand it. When it was first done I thought yikes I liked it a lot more before the cream cheese. But after it sat in the fridge for a few hours and heated up it ended up being super delish! Bravo. Definetly a keeper. My pescatarian husband even loved it. Thank you for the recipe! Think I’ll get some cashew butter. I made this recipe and it’s delicious. Kids loved it too. Super easy as a weekly staple. I didn’t have Imitation beef broth so I used Imitation chicken broth. I also added handful of spinach. This is awesome. This recipe is insanely delicious and SO easy! I added some red wine to the broth and added frozen peas, but I know it still would’ve been great without it! I can’t believe I’m saying this, but I think it actually beats the stroganoff my mom made for me as a kid! ! I love this recipe!! I had to make a few substitutions because my local shop didn’t have everything. I used vegan sour cream (Tofutti brand) instead of cashew butter plus an extra dollop of vegan cream cheese. I also had to use vegetable broth because I couldn’t find any imitation beef. It was still incredibly delicious and the comfort food I have been longing for. Thank you! Also, my dairy and meat eating boyfriend loved it too. I’ve tried this recipe twice now and we absolutely love how easy it is to prepare and how comforting it is! Your Recipe and Presentation both are perfect. You make me your’s fan. Trust Me that Recipe colour and Images are lovely so, I just imagine how was the taste of this recipe. I have Only one word at this time my mouth watering when I saw your recipe. OMG… this was amazing! I never leave comments but had to let you know how much I love this recipe. I am not good in the kitchen and I am so grateful when I find a recipe that’s easy and yummy. This is going to be part of my regular menu rotation. Thank you so much! I make this all the time now! I use a can of fire roasted tomatoes in place of 1 cup of the water and cut the bouillion, I also throw in spinach or arugula at the end! I use some vegan cream cheese or sour cream. So So delicious! Thanks so much! You really wont lose ANY flavor by using vegetable or mushroom broth/stock. Might as well go all the way. Wow! Okay. I just made this for me and my wife. I followed the recipe and it turned out AMAZING! This is the most stroganoffy tasting vegan stroganoff EVER. Major Kudos. I cheated and bought some parmesan just incase it sucked. NO NEED! I can’t even. SO GOOD!!! HIGHLY RECOMMENDED… can I give it 10 stars? Awesome! So glad you both enjoyed it Mike! No, the pasta will not have the same consistency once you freeze and thaw it. This is an amazing, savory, fast dish! I used tahini instead of cashews butter and regular vegetable base. Even my picky fungi hating husband ate it! I will definitely try more recipes from this site! Thanks for the recipe! so happy to hear that, Kristin! I’m not necessarily vegan but am trying to limit meat and dairy in my diet. I made this recipe by the book, except used vegetable better than bouillon base. I couldn’t find the no beef base. This was my first vegan recipe and it is delicious. Will definitely be a new staple in my life. Thanks!! What an awesome and easy recipe! My husband loved it and even took some into his office to share with his staff…sharing food is always the ultimate compliment! I used vegetable stock and chickpea rotini…just delicious! Thank you!!! Made this tonight for my wife and I, and it was amazing! We both don’t care for nutritional yeast, so we left it out, and also used veggie stock since we couldn’t find the mock-beef flavor. The cashew butter is incredible and made it so creamy! Not to mention we have tons left over for lunch tomorrow. Thanks! Hello Caitlin, I made this recipe a while ago and absolutely loved it! I am using it for a project at school where I have to use a recipe and blow it up for 150 people. I see this makes 4 servings, could you tell me how much is in each serving? Thank you! Hi Shannon, unfortunately I did not measure the volume of each portion when testing. If it’s for a demo and small portions, I’d say it could easily feed 10-12 people. Hi Caitlin, I want to follow up on Shannon’s question. I have to make dinner for 16 people and want to serve your dish along with a salad. I see you’ve posted it’s for 4 servings. So should I just quadruple everything? Do you have leftovers with the 4 person recipe or just enough? Thanks looking forward to trying this! Hi Carolyn! It really depends on the person, but personally I would not have leftovers if I made this for 4 people. Overall this recipe is a hit! My husband and I have been vegan for 2 years now. And I’ve been trying to stay away from the meat substitutes for a while because they are packed with sodium. I would like to know how to revive the dish once stored in the fridge, to be served again the next day. Absolutely delicious. My new favourite comfort food! Super yummy! I made this for dinner tonight and my meat-loving husband went for seconds. It is hearty and flavorful and great for more meat-free meals! We really enjoyed this recipe. It was very good the second day as well, we just added some more liquid until it was the consistency we like. We also threw in a handful of fresh spinach that went really well with the lovely creaminess of this recipe and gave us some of our greens for the day. Thank you! Whata the calorie content? Nutritional info? This recipe completely surprised me! 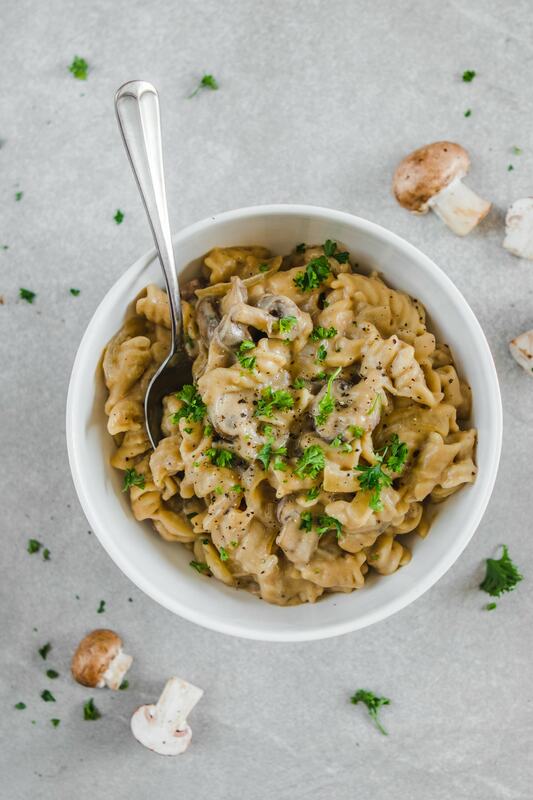 It was so simple and with so few ingredients that I didn’t have my hopes up too high; but my kids have been asking for a vegan stroganoff for months. Made this with extra wide egg noodles and changed nothing else. Super flavorful. Not that you needed any additional rave reviews 🙂 Served it with some wilted kale and spinach. THANK YOU!!! I’m vegetarian but trying to incorporate more vegan meals into my diet and this was great! So easy and quick, I’m going to be making this all through winter! I’m sorry, I don’t understand what you are saying due to the typo! 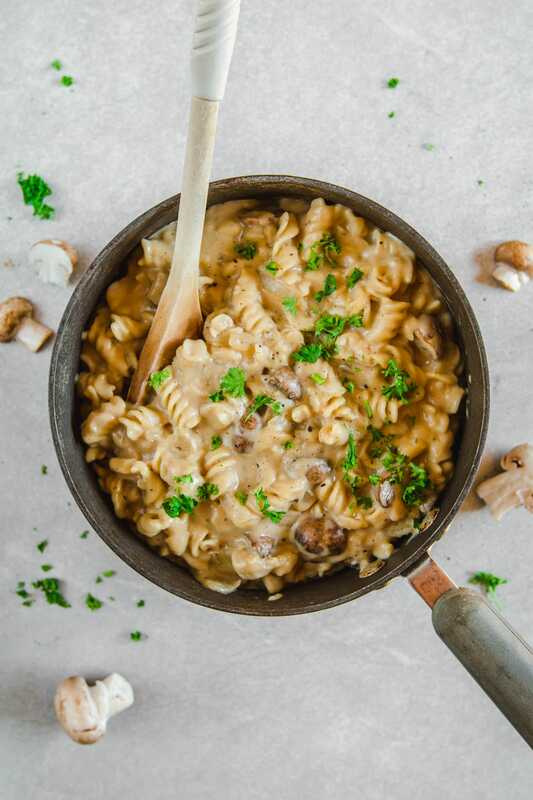 Love this mushroom stroganoff recipe, it was soo good and easy to make I surprised myself, thank you for sharing and I will definitely be making it again!! I make this at least once a month. It’s wonderful! I do add two tablespoons of dry sherry to it for extra flavor. I just made this and wow, it’s fantastic! This was so easy and quick and will be added to my list of favorite dishes. One of the quickest, easiest, and most delicious things I’ve cooked in a long time. Omg, I love this recipe super quick and so good! I highly suggest u try this if you haven’t yet . Thank u SO MUCH for this great recipe!!! 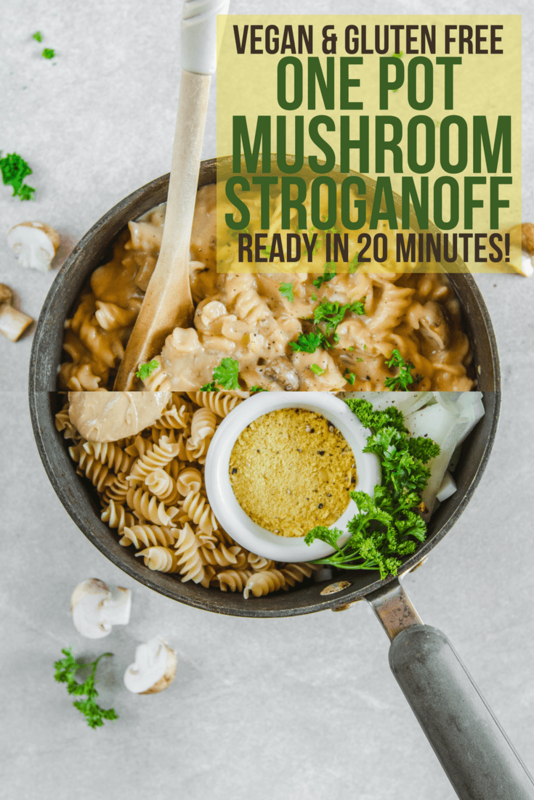 Stroganpff is one of my faves, and have been missing it since I went vegetarian. Tried a couple.of others, and they lacked. This one hits the mark. My family loved it. Hi Everyone! This was my very first vegan dish and I followed the recipe nearly exactly. I thought it had a lot of flavor from the mushrooms, The extra creamy texture of the cashew butter was a little much ( probably because I had to taste it before I cooked it). It was definitely a very hearty dish. One grandkid wouldn’t eat it and the other one hated it. lol Thanks for a solid basic recipe that I believe I will be able to make many variations from. Man oh-man Caitlin! I’ve made this three times and it’s delicious every damn time. It tastes kind of like those creamy alfredo pasta sides you get in sachets (not sure if you have those over there?) – the kind you add milk + butter to? But of course, much better because it’s made from scratch! So easy, so delicious, and it’s given me an addiction to brown mushrooms. 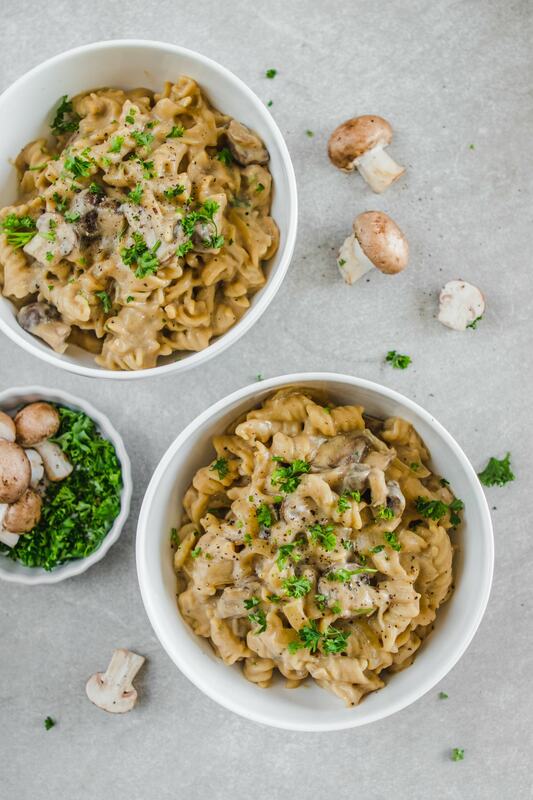 Beef stroganoff was one of my favourites before I went vegetarian, so I’m so happy to have something similar and just as comforting in my rotation. The first time I made this, I made the mistake of not reading the comments first. My son has a tree nut allergy, so I substituted the cashew butter with sunflower seed butter. Big mistake on my part! I gave it another try last night and subbed vegan sour cream instead, much much better! 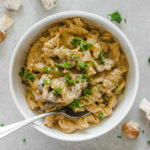 This is the best mushroom stroganoff I have ever made! I didn’t have any cashew butter on hand so I used hellman’s vegan mayo and it worked out great! It’s so creamy and flavorful with so few ingredients. Will be making again. Yummy! Thanks for the review, Patricia! I love his recipe! I had trouble finding the imitation beef flavored broth . Instead I got dried porcini mushrooms and put them in a food processor until powdered. The powdered mushrooms gives a beefy savory flavor that the veggie broth would not be able to accomplish alone. I just add it in when simmering the dish. This. Is. AMAZING!! Since going vegan I’ve been searching for a recipe that is flavorful and the main ingredient is mushroom. This is it, this is my staple, my go to, my everything!! Thank you for being amazing! I had to alter just a smidge because I was out of rotini but still had mac and cheese noodles from before our transition. I will have plenty of opportunities to try again with the proper ingredients! 😂😉 Thanks again, wish I could give it more stars!! This was hands down one of the best meals I have ever made! So delicious and easy and the family loved! I added extra pepper and used vegan Tofutti sour cream instead of the cashew butter. I have not used nutritional yeast before but I am amazed at how much it made the recipe. Very creamy and delicious. Thank you! My husband loved it! Thank you for the recipe. The only thing I did differently was I used vegan mayo instead of cashew butter as I didn’t have any on hand. Delicious!! Just made it tonight for the hubby and I and LOVED it! Shared it with my sister so she can make it too. Super good! I enjoyed trying some new ingrediants too! Hi Caitlin.. greetings from Singapore! We just had a very successful first vegan homemade dish thanks to your recipe. My 7 yr old doesn’t like meat and is dairy intolerant, this vegan dish is perfect for him and the rest of the fam enjoys it very much too! We used a mixed nut butter (with some crunch in it so yumz!) and added in shimeiji mushrooms. Love it !! What would you sub in for the pasta as it contains egg and vegans do not eat anything from animals period? Even tried colored pasta contains egg. I highly reccomend the jovial brand brown rice pasta. Gluten free and vegan and cooks al dente. My family loves this recipe. The only modification I made was accidentally adding an extra 1/2 cup water to my broth mix. I liked this because it kept the leftovers moist when reheating. Since this will probably be a make-ahead meal for me, I’ll keep using the extra water. So good! I am vegetarian and my husband is vegan. We both loved it! This was fantastic. I used Almond Butter instead of Cashew. Turned out perfect. I am Dragana, the writer, and editor of website http://www.momthemuse.com. It is about travel with kids and vegan/vegetarian food. I discovered this summer a new method of preparing seitan, in the sea with seagulls. I believe it is unique! Please read my story and decide if you think it will be interesting for your readers. We might exchange links, I could put your link under that story mentioning your creative recipes. Thank you for your time! One of the best damn vegan meals I’ve had to date, and EASY to make! My husband loved it too. It will definitely take it’s place amongst our favorites. One of my favorite recipes from Caitlin. My non-vegan boyfriend loves making it for me and always eats (at least) two bowls full! It’s a must try! It should work with half 🙂 So glad you’re enjoying it, Lisa! This may have been the best meal I’ve ever had. This is delicious!! I used fancy organic boullion cubes (added an extra one), plus a dash more lemon juice, and tofutti ‘sour cream’ instead of cashew butter. Really, really good. Son: What kind of stroganoff? Beef? Son: All I see is mushrooms. Me: LOL!!! 😉 Does it taste good? Son: Yea…it kinda tastes like Alfredo. This recipe is fabulous. Next time I make it, I will double the onions and mushrooms for my family’s personal taste. Delicious! And SO easy. Adding to the rotation. That’s what we love to hear over here! This is brilliant, Caitlin! So simple, fast, nutritious and delicious! I used a few more mushrooms, doubled the nutritional yeast and substituted homemade savory cashew cream for the cashew butter. My husband and I love it! So glad there are left overs for tonight! 😉 Yours is one of my favorite vegan websites. Thank you for your great work! Dumb question. Is the 4 cups of pasta cooked or is it 4 cups of dry? Holy kittens Batman!! I didn’t have cashew butter so I used Tofutti sour cream & I only had vegan chicken broth so I used that instead. I used a different pasta so I had to eyeball the broth & I probably used 1/2 cup sour cream because I wanted it gone. Best vegan stroganoff I’ve ever had. Amazing! Thanks for the review, Kitty! Great flavor! One caveat…after it sits, the liquid is completely absorbed by the pasta. Next time I would use half the pasta OR double the broth. But for this time I simply added more of the sauce ingredients to make it saucy again. This was hands down the best pasta I have EVER made! SO creamy and delicious! It’s hard to get vegan beef stock in the UK so I used vegan chicken stock instead. Also had to settle for slightly crunchy cashew butter. I had my doubts, but the taste was INSANE! THANK YOU!!! The bouillon you have linked in the recipe does it taste different than if I just used a vegetable stock? After all it is just ‘imitation beef’? Does the ‘imitation beef’ bouillon (although vegetarian) taste different than regular veggie broth? So good!!! I didn’t have cashew butter so I blended cashews with the lemon juice and a little extra water to get a super thick cashew cream and it worked perfectly:). Thanks for the recipe, we really enjoyed it. Eating this now. I used gluten free rice pasta and a regular cashew butter from Whole Foods because I didn’t feel like making my own or spending 16.00 on raw cashew butter. I also bought mushroom broth as they didn’t have no beef broth and sometimes when I use my better than bouillon veg it overpowers the dish. All that said – it was good – I did feel like the cashew butter taste was a bit much so ended up adding a lot of lemon. Also my sinuses are awful so my sense of taste is off a bit. I added more salt, sautéed garlic, garlic powder and some Italian herbs with the extra lemon to cover the cashew taste. Still very good but will make my own cashew butter next time:-) and add some spinach or kale. Or even black beans for some chew. Thank you it was very easy to make. Made this tonight and wish I could share my photos! As I’m prone to do, I tweaked and added a few things. I’ll be posting my version of your recipe on my own site, and am happy to give you credit for the original version! I made a white wine cashew cream sauce and added marinated tempeh and baby kale. It was killer good, and thank you for the inspiration. A perfect dish for a chilly evening. Yay!!! That’s what we like to hear! I’ve made and recommended this so many times. It’s so damn delicious and easy to make. You will be scraping the pot for the last of it. Hello, I am not a fan of nutritional yeast, so I was thinking of using Pacific Mushroom Gravy ( Vegan ) and a small amount of Tofutti Sour Cream. What are your thoughts? I have never had vegan sour cream, so what would you recommend for the amount if I use it? Thank you. My family isn’t vegan but we tried this recipe tonight and it is amaaaazing. I would hands down make this again! Delicious! I used Banza chickpea rotini and needed to add a little more water at the end likely because chickpea pasta is a little more robust than other gluten free pastas, but a really wonderful vegan dish for my winter rotation. I made this tonight for dinner and it was delicious! I only had veg broth so to add a little meaty flavor I used just shy of a tbsp of Annie’s Vegan Worcestshire Sauce. I can’t wait to try more of your recipes. I made this tonight for dinner and it was delicious! I didn’t have beef flavored veggie broth so I added about a tbsp of ‘Annie’s Vegan Worcestershire Sauce’. I really like that it only uses one pot. I will definitely be making this Stroganoff again. I made this dish for a potluck dinner. I didn’t have parsley, so I put frozen peas toward the end. Delicious! Everyone raved about it. Thank you! I bet it would be great with peas! Great recipe, It turned out really well. The one thing I would do differently next time is add some celery. Thanks for sharing this recipe! Cheers! I love this! This proves that mushroom is another amazing and indeed a magical plant. Thank you for sharing those mouth-watering recipe. Will surely give it a try. Amazing! Mine was soupy, not creamy so I let it sit for 5 mins. after adding the lemon juice & veggie mayo (I didn’t have cashew butter.) It firmed up some, but never got creamy like your photo. That said, it was a huge hit – everyone in my family took seconds, which is unheard of. And I imagine we’ll be fighting over the leftovers tomorrowI I’ll make again & tweak the liquid to make it less soupy. Thanks for a super easy recipe! Great, easy recipe! Mine turned out soupy – probBly because I used gluten free pasta. So I add a corn starch slurry while it was boiling and it thickened right up! That was one pot of deliciousness! My whole family loved it. Thanks for the great recipe, Caitlin. I made this tonight and I just can’t get over how amazing it is. I’m a new vegan so I haven’t quite found my go-to recipes yet. This is my new go-to!!! So easy and so delicious. I used mixed mushrooms and threw in a zucchini that needed to be used. So, so so good. I need to try your other recipes ASAP!! There are several certified vegan flavors of better than bouillon! Yassss kween!! You are killin the game with these recipes. If you want a delicious, healthy meal with little clean up then stop right here and make this. My non-veggie boyfriend was shocked at how good this was and it is now a rotation of my meal prepping. I have sent this recipe to all the non-believers (aka meat eaters) in my life and I’m certain it’ll change their minds about veganism. Also, if you like this check out the pumpkin pasta dish! Thanks for makin healthy yet scrumptious meals Caitlin! Ha! Thanks girl 🙂 I appreciate it, and I’m glad your boyfriend enjoyed it too! I had to do a bunch of alt since I have a lot of sensitivities, and I was really surprised that this turned out at all, but it was really delicious! I used sunflower seed butter instead of cashew, and vegetable broth instead of beef, and apple cider vinegar instead of lemon juice. My only issue was that the sauce was really watery, so when I make it again I will probably add some arrowroot power to help thicken it. I have to admit that I was shocked that the gluten free pasta was perfectly cooked, since when I straight up just boil it I have issues sometimes. Will definitely make this again. So glad to hear it worked out for you! New favorite comfort good meal! Terrific after a stressful day of work! This is the first recipe of yours that I’ve made and my goodness – it is absolutely delicious! I made it with Banza brand chickpea pasta and it turned out wonderfully! Can’t wait to try your other recipes! This was truly excellent! followed it exactly and loved it. Thank you so much. I made this tonight and I almost fell off my chair. It’s the most delicious thing I’ve ever eaten. There’s really nothing else to say about it. Haha! I love that 🙂 Thanks for the review, Nicole!